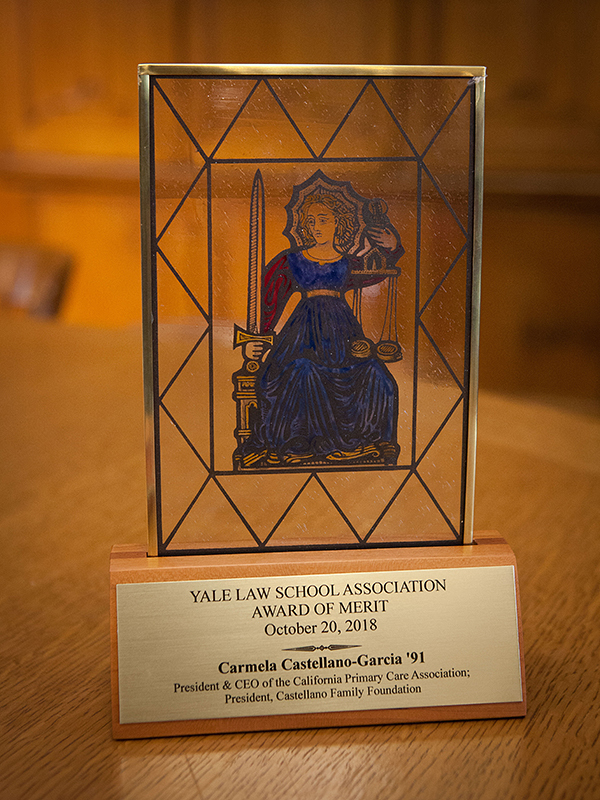 CPCA’s CEO, Carmela Castellano-Garcia, received the 2018 Award of Merit from Yale Law School in a ceremony at the law school campus in New Haven on October 20th. She was joined by her parents, Alcario and Carmen, as well as her brother Armondo and sister-in-law Pricilla and her husband Angel Garcia along with close friends Felicia Strati and Jaime Chan. She was also joined by CPCA board member Jane Garcia, CEO of La Clinica de la Raza and a Board Member of The California Endowment. Jane is also a Yale alumni and a member of the first full class of women that were admitted to the school in 1971. Click here to see Carmela’s award acceptance remarks. Since 1957, Yale Law School has recognized distinguished alumni or faculty that are exceptional in his or her field and have made a substantial contribution to public service or to the legal profession with the Award of Merit. Other notable recipients include U.S. Supreme Court Justice Sonia Sotomayor (’79), Hillary Rodham Clinton (’73), and California Governor Edmund G. Brown (’64). Ms. Castellano-Garcia served for six years as a staff attorney and managing attorney with Public Advocates, Inc., a public interest law firm in San Francisco where she litigated in the areas of employment discrimination, insurance redlining, and ensuring access to the information technology for minority and low-income populations. In 1992 she founded the Latino Coalition for a Healthy California (LCHC), a healthcare policy and advocacy organization seeking to improve access to health and human services for California’s Latino population. She was the Executive Director of LCHC from 1992-1997. She has served as the President and CEO of the California Primary Care Association since 1997, and represents the interests of California’s community health centers and the 6.5 million patients they serve. She has been committed to advancing multi-cultural health policy issues for more than 25 years, and has become a leading expert in a wide array of health policy issues including access to care for vulnerable populations, health care reform, payment reform, and primary care workforce. She continues to be a staunch advocate of social justice issues including immigrant and women’s rights, educational equity and access. At CPCA’s 2018 Annual Conference, Ms. Castellano-Garcia discussed the award in her welcome remarks and the fact that it was an honor she shared with the health center leaders in the room. Highlighting the tremendous success of the health center movement in California and the amazing work health center leaders do here in the golden state, Castellano-Garcia celebrated this recognition in partnership with everyone in the room. Click here to see Carmela’s 2018 Annual Conference welcome remarks.